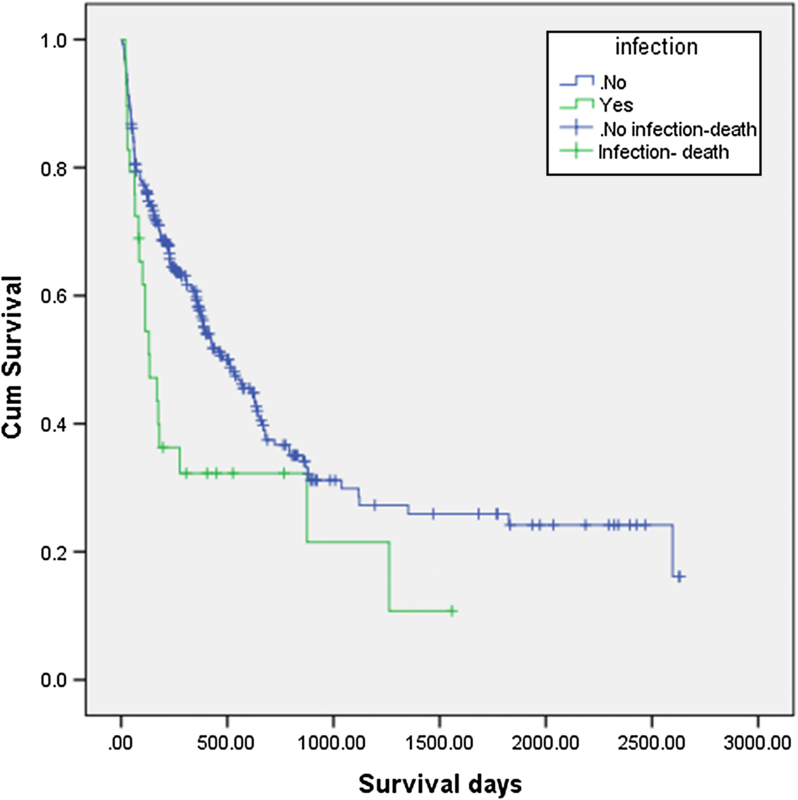 Does surgical site infection influence neurological outcome and survival in patients undergoing surgery for metastatic spinal cord compression? Most of the literature on infection after surgery for spinal metastases focuses on incidence and risk factors for surgical site infection (SSI). To the best of our knowledge, there is no report on the influence of infection on neurological outcome and survival in patients undergoing emergent surgery for metastatic spinal cord compression (MSCC). Our aim was to establish if SSIs adversely affected the neurological outcome and survival in patients with MSCC. We reviewed 318 consecutive patients admitted for surgical intervention for MSCC from October 2005 to October 2012. Morbidity (neurological outcome, length of hospital stay and additional procedures) and survival rates were analysed. During this study period, the incidence of infection was 29/318 (9.1%). The median length of stay in hospital in the infected group was 25 days compared to 13 days in the non-infected group (p = 0.001). Twenty out of the 29 (69%) infected patients underwent an additional procedure (29 procedures in total) compared to 9/289 (3%) non-infected patients (p = 0.001). There was no statistical difference between the two groups with regard to neurological outcome (p = 0.37) but the survival rate was statistically different between the two groups [infected group: median survival 131 days (19–1558) vs. non-infected group: 258 days (5–2696; p = 0.03)]. Surgical site infection increased the morbidity with considerably longer hospital stay and requirement for additional procedures. Although there was no difference in neurological outcome, the infected group of patients had a significantly shorter survival. The online version of this article ( https://doi.org/10.1007/s00586-018-5797-4) contains supplementary material, which is available to authorized users. The spine is the most common site of metastases in the skeletal system. It is estimated that 10% of patients with cancer present initially with spinal metastases. The most common symptoms of MSCC are pain, radiculopathy, myelopathy or autonomic dysfunction . The main goal of the surgical treatment of the MSCC is to maintain/restore mechanical and neurological function. However, the complication rate remains relatively high with surgical site infection (SSI) after surgery for spinal tumours to be between 0.9 and 38% depending on the type of procedure, patient population and pre-operative diagnosis [2, 3]. Surgical site infection after spinal surgery is particularly distressing with risk of spread of infection to the central nervous system, chronic pain, deformity, paralysis and even death . It is more of a concern when treating MSCC as there is higher risk of infection compared to non-tumour spinal surgery [4, 5]. This is likely due to the association of patients with spinal tumours having multiple comorbidities, complex surgical procedures with instrumentation, adjuvant treatments with radiotherapy, chemotherapy and steroids [2, 6, 7]. Most of the literature on infection after spinal metastases focuses on the incidence and risk factors for SSI [8, 9, 10]. With the improvement in surgical techniques and anaesthetic management, patients who are at a higher risk for surgical site infections are increasingly being considered for surgery. Hence it is imperative to know whether infection poses any risk to the neurological outcome and survival in patients with MSCC. To the best of our knowledge, there is no report in the current literature on the influence of infection on neurological outcome and survival in these patients. The objective of our study was to analyse the effect of surgical site infection on the morbidity including neurological outcome and survival in patients with MSCC. We performed a retrospective study of prospectively collected data of 318 consecutive patients who were admitted for spinal surgery for MSCC between October 2005 and October 2012. All patients who were surgically treated for MSCC with a known or unknown primary tumour were included in the study. Exclusion criteria included patients treated by radiotherapy alone, patients having a cement augmentation procedure without decompression and patients who had undergone previous surgery for spinal metastasis. The information recorded for each patient included demographic and tumour data—age, gender, site and type of primary tumour, revised Tokuhashi score ; surgical data—site of MSCC and type of surgical procedure; outcome data—complications (especially infection), requirement for further surgery, length of hospital stay, change in neurological outcome (Frankel score as recorded in medical notes pre-operatively, post-operatively and at final follow-up or death) and survival. All patients received peri-operative antibiotics to cover commonly encountered organism as per our Trust recommendations: a single dose of flucloxacillin 1 g IV + IV Gentamicin (< 70 kg, 120 mg; > 70 kg, 160 mg) with a re-dose of flucloxacillin 1 g IV at 4 h if operation lasts longer than 4 h or blood loss > 1500 ml. Flucloxacillin is repeated at 12 and 24 h post-operatively where instrumentation is used. Teicoplanin 400 mg IV is used if allergic to Penicillin. Research approval was not required as this study was conducted for ‘service evaluation’ as per our Hospitals’ guidelines. Statistical analysis was performed using SPSS 17.0 version software (Statistical Package for Social Sciences, SPSS Inc.). Student’s t test was used to analyse the statistical significance. Survival data were computed using Kaplan–Meier product limit method, and the survival curves were drawn for each group. Log rank Mantel–Cox test was used to show difference in survival between groups. P values < 0.05 were considered significant. 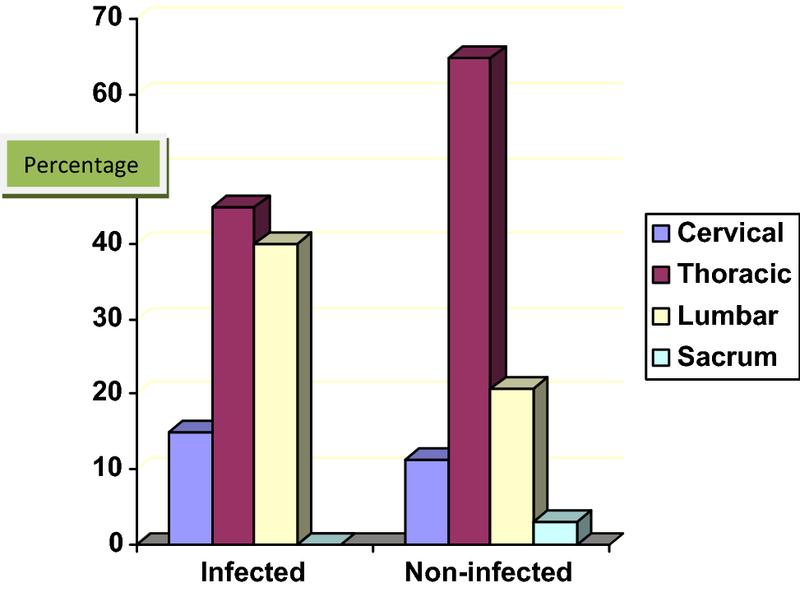 The incidence of infection was 29/318 (9.1%) during the 8-year study period. There was no statistical difference in the general demographic data, mean revised Tokuhashi score, albumin levels or adjuvant treatments between the infected versus non-infected groups (Table 1). The distribution of primary tumour type was also similar between the two groups (Table 2). There was no significant difference in the most common primary tumours. The only significant difference between the infected and non-infected groups was in the number of unknown primary (greater in infected group, p = 0.01) and the ‘other’ tumours (more in the non-infected group, p = 0.03). There was also a similar distribution of the site of MSCC in the two groups (Fig. 1)—the majority of these were in the thoraco-lumbar region 24/29 (83%) in the infected group versus 243/290 (84%) in non-infected group. In the infected group, all patients except 1 had instrumented stabilisation as well as a decompression procedure. In these 29 patients, all patients had a posterior approach except 1 who had an anterior approach only. In 18/29 (62%), Staphylococcus aureus was isolated, of which one patient had MRSA, 2/29 (6.9%) pseudomonas, 9/29 (31%) mixed gram-negative organisms. Appropriate antibiotics were used as per the sensitivity assay. The infection was deep to the fascia in 19/29 (65%) and superficial to the fascia in 10/29 (35%). In the non-infected group, 272/289 (95%) patients had decompression and instrumented stabilisation. The majority again had posterior approaches only (236/289 82%), 32 (11%) had an anterior approach only and 21 (7%) had combined approaches. The median length of stay was 25 (3–88) days in the infected group and 13 (1–181) days in the non-infected group, which was statistically significant (p = 0.001). Most patients with an infected wound required additional procedures (20/29, 69%) in the form of debridement (Table 3). Five patients had to undergo subsequent surgery for non-resolving infection, and two patients had three surgeries for the same. In total, 29 additional procedures were performed in this infected group. Vacuum assisted closure dressing (VAC dressing, KCI Medical, UK) was used in one patient due to extensive skin loss. All other complications are shown in Table 4—in the non-infected group, nine patients had revision surgery for metalwork failure/tumour recurrence and two due to adjacent vertebral body level fracture. There was no difference in the neurological outcome between the groups with most patients remaining the same or improving by one Frankel grade—28/29 (96%) in the infected group versus 248/289 (86%) in the non-infected group (p = 0.37; Tables 5, 6). The Kaplan–Meier survival curve is shown in Fig. 2. The median survival time for the infected group was 131 days (19–1558) and 258 days (5–2696) for the non-infected group (p = 0.031). The overall survival was 246 days (5–2696)—there was 1 death caused directly due to sepsis and in the non-infected group there were 3 deaths due to pulmonary emboli in the immediate post-operative period. Using the Kaplan–Meier method, the survival plot was created, and further statistical analysis with the log rank (Mantel–Cox) method showed significant difference between the groups (p = 0.015). Overall 43.5% survived at final follow-up (infected group: 28% vs. non-infected 45.5%). This retrospective study is perhaps the first to directly study the link between infection in patients undergoing emergent surgery for MSCC with further morbidity and mortality. During our 8-year study period, our incidence of infection following surgery for MSCC was 9.1% (29/318). These patients had significantly longer hospital stay (median 25 days vs. 13 days, p = 0.001) and underwent more procedures (29 in total). Although their neurological outcome was comparable to non-infected patients, the infected group of patients had a significantly shorter survival (median 131 days vs. 258 days, p = 0.031). Surgical site infection after spinal surgery can potentially be devastating , and thus, prevention and early treatment are important strategies. Whilst the management of SSI has vastly improved over the years, infection rates for spinal tumours have remained at a higher level when compared to other spinal surgical procedures [2, 4, 5]. Several studies on infection after surgery for spinal tumours have focussed on risk factors and this discussion is beyond our paper [2, 3, 8]. Diabetes, obesity, malnutrition especially pre-operative protein depletion, smoking, alcohol use are patient-related risk factors. The risk factors that are surgeon related include peri-operative use of steroids, length of procedure, extent of surgical procedure and the need for complex plastic closure. Omeis et al. in their univariate analysis also found pre-operative radiotherapy to be a significant risk factor for SSIs, which is in agreement with others . More recently, Kumar and colleagues, 2015, studied 95 patients finding quite a high risk of infection at 17.9%. They further reported that levels of surgery (seven or more) significantly increased the risk of infection in patients undergoing surgery for spinal metastases . Quraishi et al. conducted a study of 289 patients who underwent urgent surgery for spinal metastasis. These authors found a modest re-operation rate (31/289; 10.7%)—most of these were for surgical site infection (13/31; 42%), failure of instrumentation (9/31; 26%) and local recurrence (5/31; 16%). They concluded that patients with metastatic disease could benefit from revision surgery with comparable median survival rates (single surgery group: 250 days (range 5–2597 days) and revision group: 215 days (range 9–1352 days) but relatively worse neurologic outcome (20 patients (8%) from the single surgery group and 7 (23%) from the revision group were worse off neurologically). This study did not look at patients separately with an infection. Further, only SSI necessitating revision surgery was reported. Our present study found an overall infection rate of 29/318 (9.1%), and 20 of these required an additional surgical procedure. These patients invariably have a short(er) survival due to the nature of their condition. An earlier study from our unit showed an average of 45.6-weeks survival in 70 patients with spinal metastases . Survival rate in our study overall was 43.5% at 1 year and this is consistent with the other studies, though generally, other reports have not studied the influence of infection on outcome . Survival rate though heavily depends on several factors—the primary site of tumour, systemic metastases and the presence of pathological fracture amongst others. It is also agreed that the prognosis with myeloma, lymphoma, prostate and breast carcinoma is better than that of pulmonary, gastric and adenocarcinoma of unknown origin. However, there was no significant difference in the revised Tokuhashi score in our groups. So, if this score is believed to offer reasonable consistency between predicted and actual survival , then it can be assumed that these two groups were indeed well matched in terms of their prognostic scoring. Lei et al. have attempted to validate a pre-operative scoring system for survival and functional outcome of lung cancer patients with MSCC after posterior decompression surgery. Perhaps not surprisingly, they found those with shorter survival (life expectancy < 3 months) and poor functional outcome to be best treated with radiotherapy and palliative care. The influence of surgery on health-related quality of life (HRQoL) has become even more important over the last few years [17, 18], especially considering that metastatic spinal lesions treated with surgery have the highest mean cost among all oncological musculo-skeletal issues . Fehlings et al. , in a prospective North American multi-centre study of 142 patients with single symptomatic MSCC, found that surgery, as an adjunct to radiation and chemotherapy, provided immediate and sustained improvement in pain, neurological, functional and HRQoL outcomes with acceptable risks in patients who have at least a 3-month survival prognosis. 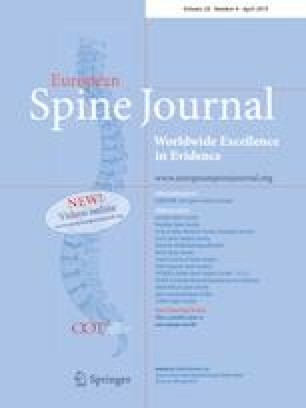 The Global Spine Study Group, in a large prospective multi-centre cohort study of over 900 patients, showed sustained improvements in EQ-5D and pain scores over 2 years ; with the extreme increase in the incidence of cancer in China, this country in particular offers the opportunity for a national registry  to enhance patient care. In an extensive systematic review conducted by Bakar et al. , the authors found that the most commonly cited complication from decompression surgery for spinal metastases was wound infection or dehiscence (22 studies), which occurred in 2.5–16% of patients. The length of construct (generally fixation two levels above and two levels below the site of cord compression) and duration of surgery are also useful considerations for the development of infection which we have not reported. But our comparatively lower infection rate to Kumar’s series of 17.9%  may be due to smaller length of constructs that we utilised. Our study is perhaps novel in the examination of infection and its effect on neurological outcome, morbidity and mortality. Furthermore, we focus entirely on patients undergoing emergent surgery for cord compression caused by spinal metastases. It is however a retrospective analysis, be it, in a large number of patients. The occurrence of surgical site infection increases the morbidity following surgery for MSCC with significantly longer in-patient stay, more procedures and shorter survival. However, the neurological outcome is not adversely affected by the occurrence of an infection. The authors declare that they have no confict of interest.